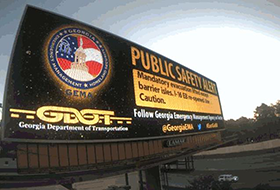 The scale, viewability and dramatic effect of outdoor advertising helps marketers create cut-through and capture consumer attention in a world where other messages struggle to get through. Less appreciated is the variety of marketing objectives it can achieve. As brands have shown recently, outdoor has applications at different stages of the purchase funnel and can execute on several elements of a marketing strategy. 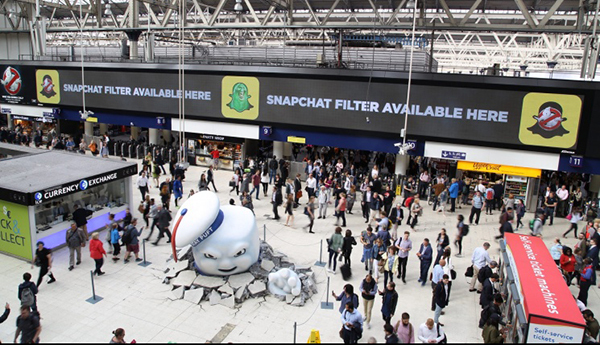 In July, Sony marked the release of Ghostbusters with a takeover of London’s Waterloo station, centred on a giant installation of the film’s Stay Puft Marshmallow Man character emerging from the ground. Waterloo was chosen for its footfall and scale. The station was adorned with ectoplasm, ticket barrier branding and a wrap of the Underground station. Collaborating with JCDecaux, screens showed spoof news footage, while a pop-up shop offered Ghostbusters merchandise and Odeon representatives sold film tickets. "The objective of outdoor is not to go viral on social, it’s to build awareness and increase engagement." The outdoor activity impressed Williams with its amplification through publicity and engagement, helping the film have a point of difference among the summer blockbusters. Outdoor advertising has been part of the Facebook media mix for several years. 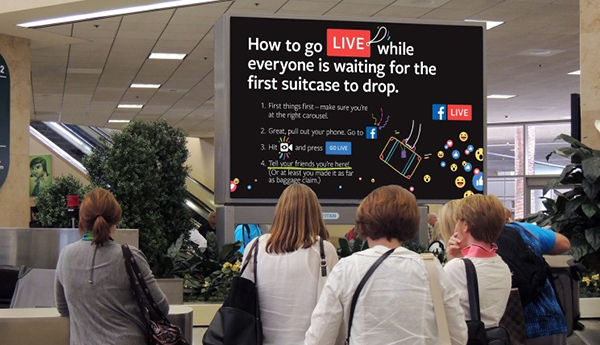 While brand awareness was the focus of the ‘Friends’ (2015) and ‘A Place For All’ (2016) campaigns, Facebook’s latest out-of-home (OOH) shifted towards product awareness. Large format ads were run in conjunction with smaller format street level tutorial ads in London, Liverpool, Manchester, Leeds, Newcastle, Glasgow, Edinburgh and Times Square in New York. Digital boards promoting Facebook Live at the BFI IMAX and Waterloo were designed to reflect the time of day and whether it was a weekday or weekend. Other boards changed message according to their proximity to a sports stadium or music venue. This real-time approach was also the focus of the England & Wales Cricket Board’s (ECB) summer digital OOH campaign, which broadcast live scores and Twitter updates of England’s summer internationals against Sri Lanka and Pakistan on screens in city centre locations. Working with digital OOH agency Grand Visual, the campaign ran across nine cities including Leeds, London and Manchester, taking in more than 20 outdoor sites. The aim was to attract new consumers, as well as die-hard fans. To promote its US election coverage, in October the Financial Times launched ‘Facts. Truths’, a campaign highlighting the real statistics behind a range of election issues. Drawing on the newspaper’s reporting, the campaign was designed to grow readership and increase engagement with its journalism. Spanning print, digital, experiential, broadcast and paid media, the campaign used outdoor elements in London, New York and Washington – cities where the most voracious readers of its election coverage lived. 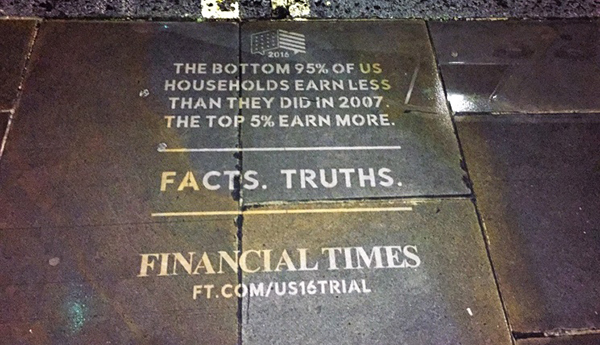 The ‘reverse graffiti’ style campaign saw FT verified facts power-washed onto the pavements in each city. Disruption was also the aim last month of Go Vegan World’s outdoor campaign in Birmingham, which flipped the traditional presentation of animals on its head through a high-impact OOH campaign spanning taxi adverts, digital billboards and video screens. To coincide with the outdoor activity, Go Vegan World distributed pamphlets and held talks exploring the issue in more depth. People could download guides to veganism by scanning QR codes on the billboards. Outdoor represented a significant proportion of Monster’s biggest advertising campaign for the past four years. The online recruiter harnessed OOH’s scale and visual nature to reinvigorate its brand, introducing a new monster character to appeal to 18- to 35-year-old job seekers. "Outdoor not only gives scale, it helps us connect to audiences." Staggered in two waves – May and June and September and October – the campaign included a takeover of BFI IMAX and bus wraps, as well as ads at London underground stations and shopping centres. Monster also engaged street artists to paint the purple monster onto high profile sites in Clerkenwell, Shoreditch, Brighton and Manchester. The activity had a big effect. Warner reports above-average recall for the campaign, which was seen by 77% of the target audience. “We saw a 15% increase versus the baseline we would expect to apply for jobs during the period, with Google searches for the related terms ‘jobs’ and ‘Monster’ up 20% to 25%,” he says. In a world of digital advertising, social media and high-profile TV slots, outdoor advertising offers the scale and theatricality to drive not just mass awareness but also consideration and intent to purchase.